Weeping willows are rounded trees used in landscapes and along stream banks, or in other areas that sometimes may experience long periods of light flooding or wet soils. Not native to Europe and North America, the tree is often planted for its open crown and graceful lines. A deciduous tree, the willow provides soft green during the summer and graceful curves for winter interest. Weeping willows originated in China. Hybridized versions of the original Chinese Salix babylonica are found along ancient trade routes between Europe and China. The path of the introduction of this tree to Europe went through southwest Asia to the Middle East. The tree was introduced to Europe in 1730 and traveled from Europe to North America with colonization. Because of the history of its spread, weeping willows are found in many parts of the world. However, in North America, the tree is limited to United States Department of Hardiness Zones 6 through 8. The tree grows from from southern Maine and Vermont southwestward into Illinois, Kansas and Missouri and as far south as central Texas, and north through eastern California and into the Vancouver, British Columbia, region of Canada. Weeping willows have often formed hybrids with other willows. For example, the Chinese Salix babylonica crossed with the white willow species Salix alba in 1908 resulted in the most commonly cultivated weeping willow trees in England. The tree, however, was introduced as through a German nursery. Other cultivars of the Salix babylonica include the 1838 variety known as S. babylonica crispa, with its twisted, spiral leaves, and the 1869 French hybrid variety of S. babylonica salamonii, which features a pyramid-shaped crown with only the ends of the branches drooping toward the ground. Weeping willows are easily identified when compared to other willows. All varieties feature branches that grow from a central trunk. Those branches rise for a length--the distance varies, depending on the cultivar--before drooping pendulously down toward the ground. This creates a more rounded appearance to the tree. Leaves are light green on top and grayish green on the bottom. Exact shape and size can vary, depending on the cultivar. 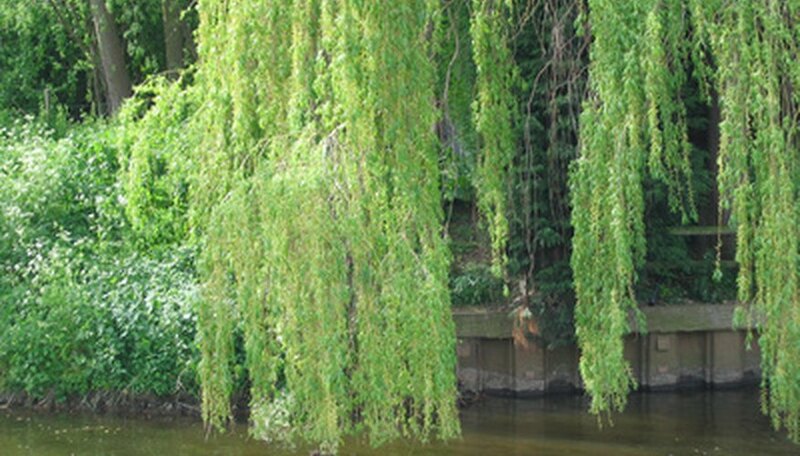 Weeping willows grow to between 30 and 40 feet tall and can reach nearly 40 feet in spread. A fast-growing tree, weeping willows require full sun, regardless of the cultivar. Weeping willows can grow in a wide range of soils. Although they are drought-tolerant, they can also grow in wet soils, such as those along stream banks or lake shores.